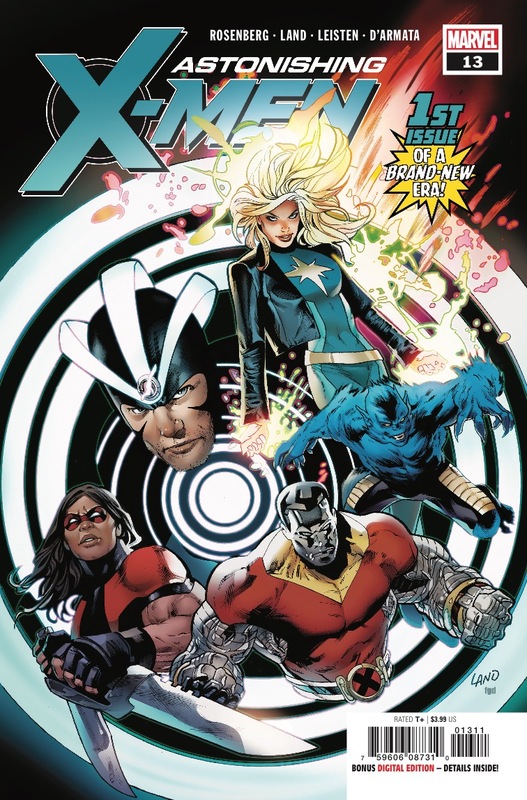 Astonishing X-Men #13 review: A new era begins with a great start – AiPT! Rosenberg and Land alleviate all apprehensions and begin the new era on the right foot. When it was announced in spring that writer Matthew Rosenberg (Multiple Man) was going to be taking over Astonishing X-Men, it was met with fanfare and excitement. The enthusiasm became palatable when artist Greg Land (The Incredible Hulk) was also advertised to be part of the new creative team. Despite the strong crew that would be taking over, there was one important question: just how good would the new era of Astonishing X-Men be? If Astonishing X-Men #13 is any indication, the new era will be a great addition in the annals of X-history. The issue starts quickly and never slows down. Rosenberg is at the top of his game as jokes jump off of almost every page. The students at the Xavier Institute for Mutant Education and Research have some great one liners and there is a awesome running joke about the X-Men name. The real star of the book is Havok, however. From his opening exchanges with the Avengers to later ones with Kitty Pryde, Cyclops’s brother carries Astonishing X-Men nearly on his own. We follow the disgraced hero as he tries to reassemble the pieces of his life. Humor is a common defense mechanism and the way in which Havok is dealing with his difficult situations is incredibly realistic. The book does not solely rely on humor, though. Alex Summers gives a stirring speech about what direction he feels the X-Men should go in. He also has a terse back and forth with Kitty that may be sprinkled with humor, but also has an underlying tension. Rosenberg writes Havok as pitiful, funny, and somewhat embarrassing, and in doing so, writes one of the most real super heroes in years. It appears as if the first villains in the Rosenberg/Land era will be the Reavers. Unsurprisingly, when Donald Pierce and his gang of cyborgs are involved, there tends to be action. Along with the Reavers, there are appearances from other members of the Marvel universe and the comic climaxes with an ending that combines both humor and action. On top of the great writing is the magnificent art of Land. There is some amazing detail throughout Astonishing X-Men which adds another layer to the already well written characters. Emotions pour through everyone’s face while the battle scenes are exciting. Best of all, the art never overpowers the writing or vice versa. Instead, the two work hand in hand to deliver a powerful story. Whenever there is a creative shakeup involving one of Marvel’s biggest franchises, there is going to be excitement and trepidation. In Astonishing X-Men #13, Rosenberg and Land alleviate all apprehensions and begin the new era on the right foot. Great mix of humor, action, and tension. Hard to find any fault. There are too many characters? Too many jokes? Havok looks odd in one early panel? I got nothing.